JBL EON 518s Portable Self-Powered 15”, Two-Way, Bass-Reflex Design DJParts - All Variety of Parts that DJ Needs. EON 518S Portable Self-Powered 18", Bass-Reflex Design The EON518S is an 18-inch, direct radiating, high performance powered compact subwoofer system. Designed to extend low frequency performance of any EON system. It also offers the convenience of an integrated crossover and stereo loop-thru capability. 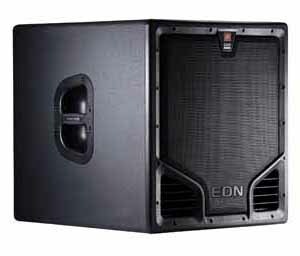 The EON518S is comprised of a 460 mm (18") Differential Drive® woofer driven by a 500 watt Class-D digital amplifier. Live sound reinforcement, speech and vocals, music playback in entertainment, A/V, and institutional venues – especially when ease of use and portability are important factors. Extending the low-frequency output performance of powered and non-powered full-range speaker systems. Optimized for complete compatibility with EON® full-range speakers.